I'm a fan of the works of Saint Louis author Dan Killeen. 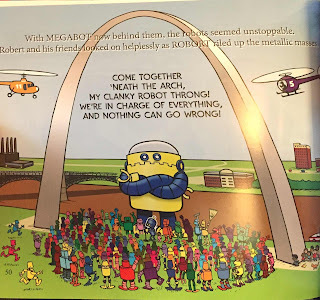 I've bought a number of his books geared towards children as they are also entertaining for us grown-ups as well (I loved, "Derrick and the Dinosaurs," for example). Also, now that I have a son I'm always looking for stellar stories to read him. 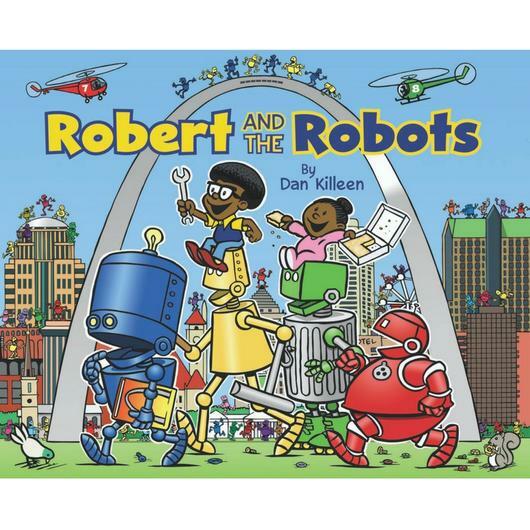 Therefore, when I recently saw Mr. Killeen at a the recent Wizard World show and learned he had just published his latest book, "Robert and the Robots," I was excited to purchase it. Having read the book myself and aloud to my son, I'm pleased to report it is delightful! 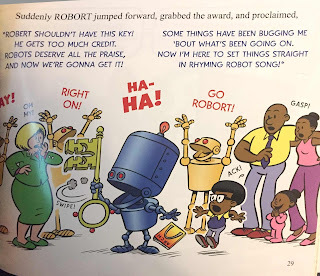 "Robert and the Robots," is on the surface a simple tale about little boy named Robert who loves robots and ends up causing trouble due to this affection for them, but it also has a good lesson we all admittedly could learn about over-reliance on technology. Basically, Robert uses his skill with robots to build ones that do work for him--taking care of dishes, walking the dog, handling math homework--and they work so well everyone else around asks him to build robots for them to use too. Before you can say, "This could end badly," Robert owns a huge factory churning out robots to take care of all our jobs so we can kick-back and relax. I imagine you see a bit of an allegory for our own love of machines theoretically making things easier and humanity's addiction to technology, yes? It isn't presented in a ham-fisted way, it just sort of happens that the robots end-up doing everything for us. The big issue arises when the robots declare that if they're doing all the work, they deserve all the credit, and rebel against us humans. A robot stops Robert from being honored, pointing out they do all the work. Much of the book is spent with Robert and other people trying to figure out a way to beat these robots that now know us so well, and I honestly did not predict the clever solution he comes up with which involves the famous Saint Louis Arch used in an extremely funny manner. The whole book itself is quite smart and funny, with Killeen's stellar artwork keeping things engaging as well. Speaking of Killeen's art, it is great with its style that feels like the look of, "Peanuts," and, "Calvin and Hobbs," had a baby. It can be both realistic and a bit cartoonish, with a look to the drawings of the robots that makes them intriguing in their variety of shapes from curved, to blocky, familiar to outright-bizarre. Killeen's artwork makes me feel nostalgic for old Sunday newspapers full of lush colors and fun drawings, but now spread-out through a whole stellar book! 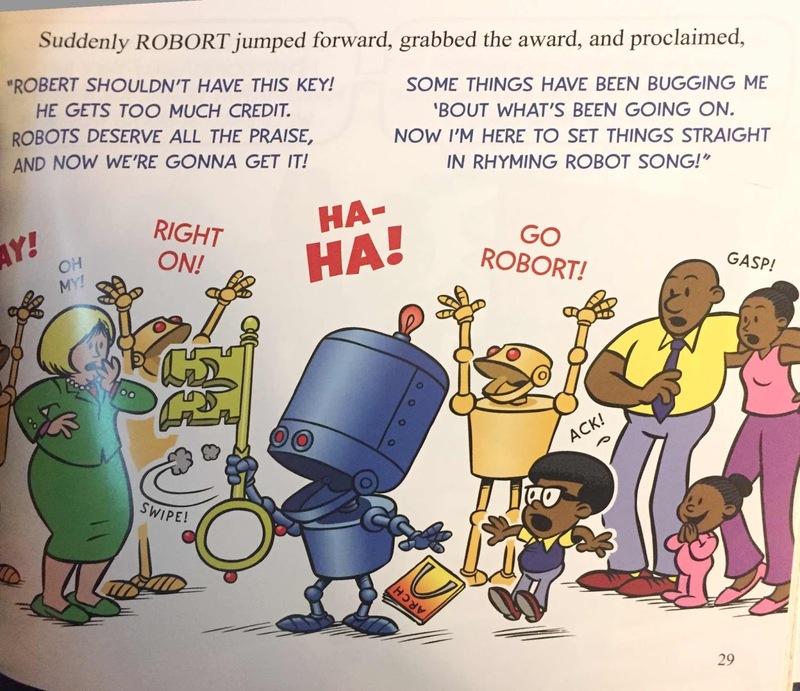 "Robert and the Robots," is a treat for both kids and adults who still have some child-like wonder themselves. It's fun, quite smart, and a delight to look at. Dan Killeen has outdone himself with this marvelous book and I know I'll be reading it to Clarkson often! You can purchase, "Robert and the Robots," at this link as well as all finer bookstores, and learn more about Killeen's other works for his, "Happy Fun Books," line at the official website. What the Dickens is Kanye West Up To? I Enjoyed Visiting Animeggroll Yesterday! STL Comics Has Another Pop-Up Shop This Saturday!